"Simply planting a seed and maintaining its growth through to it becoming an edible food is capitalism - and it's fair and it's sustainable if we optimise instead of maximise. We therefore refer to this form of capitalism as Eco Capitalism." In accordance with centralised governmental economic thinking, the current globalised capitalist system dictates that in order for businesses to survive, they must forever minimise costs and maximise profits so as to forever expand. In our opinion, these are not necessary components of a successful business or of capitalism itself and, they can actually be extremely restrictive, making businesses inflexible and therefore vulnerable [as with the banks for example]. We believe that economies, businesses, employers, employees, their communities and the natural environment would benefit far more if businesses reformed capitalism by optimising [as all in nature does] instead of maximising, by facilitating employer-participation in decision-making processes [decentralising] and, by working with [not against] the natural environment. The overriding aim for eco capitalist businesses is to focus upon sustaining healthy profit margins instead of forever expanding them. The maximisation components within capitalism [and not capitalism itself] are directly responsible for contributing towards environmental collapse and in 2013, a report commissioned by the UN into the activities of the world's 3,000 largest companies estimated that approx. 33% of profits would be lost if firms were forced to pay for use, loss and/or damage to the natural environment. The cost of damage caused by the world's top companies during 2008 alone is estimated at approx. $2.2 TN. If these companies between them paid just $100 BN, we would be able to counter much of the damage that they themselves [supported by our undemocratic political systems] have caused but, not one government in the world is prepared to force these companies [their backers] to do so and, the reductions in corporate and social responsibility taxes levied against such companies are being continually lowered so as to bribe them to remain as part of our economies, meaning that the people who own these companies are now themselves the biggest burden on Western economies as well as the global environment. Eco Capitalism is the ONLY form of capitalism that can prioritise people and the environment along-side profits without compromising business viability. Populist anti-capitalist movements [of both left and right orientation] are NOT serious about developing models with long-term plans that create the conditions for sustained economic growth and when their simplistic solutions to complex problems fail, they generally seek to apportion blame and deepen their errors and, mainstream parties pandering to populist policies simply and only to secure votes is also economically dangerous and unnecessary. Research now confirms that North American states which have the highest minimum wage levels are the strongest states economically and, that employers and their businesses benefit more from paying higher wages. In alignment with this, it shows that employers have NOT had to reduce jobs so as to fund wages at above-minimum levels. Separate studies also show how the richest of the rich take more money out of their country's economies than they pay-in and that they do NOT actually create wealth because according to them, investing in jobs is unviable [confirming yet another of David Cameron's lies]. Just as guilty are employers who create jobs by paying only the minimum wage, paying low income tax, paying low corporation tax, taking tax payer-funded state subsidies and using tax avoidance schemes while abusing the natural environment. Neither of these groups create wealth and instead, both groups are actually an economic burden and on this basis, increasing tax levels [proportionately] for such people can only benefit the economy - even if they leave the country. • Tech founder treats staff to Star Wars cinema and a free holiday - and more! Approx. £85 BN of tax payer's money is handed-out every year in Corporate Welfare payments while only £5 BN is paid-out in Income-Based Job-Seeker’s Allowance but, it is only benefit claimants who are stigmatised by the state as 'state scroungers'. Such is the nature of capitalism when it maximises [instead of optimises] that the majority of employers in any capitalist culture are too greedy to see that even if just to make more money for themselves, they would be better-off paying higher wages and respecting their staff, their community, and the natural environment. Through over 25 year's direct experience of encouraging employers [SMEs] in various industries to convert to Eco Capitalism, we have learned that selling it to them based upon having a happier and healthier workforce, of having a stronger relationship with their community and, of caring for the environment as they go is futile. The best way to sell Eco Capitalism to employers is by appealing directly to their personal greed and, we feel that this says much about the 'moral' and 'hard working' people who enjoy David Cameron's perks [income tax reductions, corporation tax reductions, tax payer-funded state subsidies, tax avoidance schemes, national insurance loopholes that allow full time jobs to be split into part time jobs and, fines for criminality that are so low that they amount to incitement to re-offend]. The richest of the rich have seen their wealth rise by approx. 15% year-on-year since David Cameron took office - while the UK's poorest [who for the first time now include those who work] eat from food banks for the first time in UK peacetime history. Pound for pound and thanks to ALL of the so-called 'representative' parties, the richest of the UK are now a burden on the economy and while UKip, the Conservatives and Labour use the issue of immigration as a red herring to cover for over-population, their multimillionaire donors cost the UK economy more than job seekers [who only cost 3% of the welfare budget] and immigrants [who in our view are both a financial and a cultural asset]. Large employers [often party donors] and their poor working conditions are always protected by politicians from the debates that assess work viability and unemployment levels and so, their low wage offers, Zero-hour contracts, half-hour lunch breaks, commission scams, autocratic management styles and managerial bullying practices [of any nature] are never cited among the reasons for why some find it more viable to claim welfare benefits instead of jobs and, the blame is always laid solely at the feet of jobless benefit claimants. The English work 'ethic' and corporate capitalist maximisation has ensured that the UK has the longest and hardest working hours in Europe, whilst being one of the least productive countries in Europe. Pizza Express, Ask Italian, Belgo, Bella Italia, Café Rouge, Giraffe [owned by Tesco], Las Iguanas, Prezzo, Spaghetti House, Strada and Zizzi STILL deduct commissions from their staff's tips and, the supermarkets continue to beat UK dairy farmers out of existence. David Cameron is only ever able to quote 'rising' employment figures by including zero-hour jobs and micro jobs and by manipulating welfare figures so, if this is your idea of a healthy and sustainable workforce and economy, keep voting and reap. It is capitalism itself that actually prevents employers from accessing free labour markets because, if workers couldn't demand a wage [and capitalise on their time], employers wouldn't have to bother paying them. An example of where this already happens is in the UK's 'Workfare' programme - where employers can terminate employment for the same employee that they can then 're-hire' free of charge. 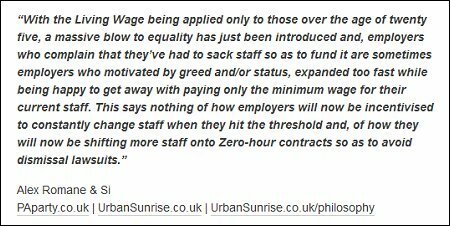 'Employees' [slaves] who refuse to comply are penalised through having their benefits cancelled and so through the programme, employers are benefiting without having to capitalise upon wage spends. It is capitalism that prevents the banks from charging customers just for the 'privilege' of having an account because banks who levy a charge for this [soon to be ALL UK banks] don't have to capitalise upon what customers invest with them. In our opinion, unelected so-called 'socialist' former PM Gordon Brown deceived the whole country [as his predecessor did regarding Iraq] when he said that we needed to give public money to the banks [that were private commercial concerns] just to keep them afloat after their greed caught-up with them in 2008. This was just one of several options and in our opinion, it was the worst option for the people and for SMEs who instead, could have argued to let the banks fall while establishing a state-run bank of the people so as to capitalise upon this but even after all the lies, the UK sheeple still want 'leaders' who make 'qualified' decisions instead of true and direct democracy. Both free labour and the current form of capitalism that maximises instead of optimises amount to systems of financial slavery and so, until humans evolve to a stage where they real-ise that using currency actually holds them back, keeps them poor and turns them against the natural world that supports them, adjusting capitalism so that it optimises instead of maximises would be far more beneficial to all [including the corporate elite themselves]. - Re-member; human cultures existed for thousands of years before they invented currencies. - Real-ise; if you now want to stop surviving and to start living, only true and direct democracy can deliver. We do not believe that it is a coincidence that humans are the ONLY social group species on the planet that doesn't use direct democracy and that doesn't optimise [which incidentally, even plants do] and, that humans are the ONLY species that is damaging the world for all of the others [who in this context, are easy to see as being far more intelligent]. With only 100 Earth harvests remaining and when we've wiped-out 40% of the world's wildlife over the last fifty years alone [50,000 species per year] and, when most state-controlled mainstream 'news' organisations stay silent about the recent methane cell releases and their associated extinction-level event, it is our opinion that humans will wipe themselves out before they learn to care and share. However, with each country that reforms to direct democracy and with each business that optimises, a new chance is created and so, the faster the better. There is already enough wealth in the world so that one person only need work two days a week to fend for a family of five but, while a lack of true and direct democracy ensures that only 300 families own half of it and while 80% of the entire wealth is in the West, the imbalance will harm all species who share this planet until it is addressed or, until the planet gives up. Whichever happens first will be the choice of all humans and not just the choice of politicians because one way or another, everyone is responsible for their country's system of governance. Even disregarding the up-coming extinction level event and disregarding that we've just reduced our food and medicine stocks by 40%, with only 100 harvest remaining we believe that while the UK parliament still has influence in over 90% of the world's countries [either militarily, culturally or politically], a failure to vote for direct democracy in time will result in today's teenagers not being able to have grandchildren. • Bob Geldof; "The human race may be extinct within 15 years." • Prince Charles; "2015 is a vital year for the future of humanity." Parents who believe that continuing to compromise the environment so as to leave their children a stronger economy [to enable them to throw money at environmental problems] are simply excusing themselves of their responsibilities because, geoengineering and technology will NOT repair the damage or end the multiple feedback loops that are being created in every month that passes. There are no future fixes so potential solutions need to be implemented now but, faced with the biggest threat to the existence of all life on this planet, humans are still choosing to gamble instead of choosing to play it safe and obviously, it is illogical to be taking ANY risks with such a problem. If you are too young to vote, we strongly encourage you to share this page with your parents so that they can prioritise you and your future above false 'democracy', income tax, hating the poor and hating foreigners. Some ultra-capitalist businesses [and sometimes whole industries] now have it factored-in to their logistics and marketing that they can pollute, kill and cause suffering on a country-wide scale [as long as its not in their country] and, that it won't matter even if you get to know about it. For example; US-based SpyPhone manufacturers Apple and most [if not all] UK-based clothing retailers still refuse to deploy meaningful and effective protocols to ensure that their Asian manufacturers are adhering to lawful employment guidelines and they never will but, only because they have learned that you'll still empower them with your money the day after the release of the latest covertly-recorded evidence that demonstrates that these retailers are as psychopathic and selfish as UK politicians are. Despite its 'pledge' [made in 2001], Nestle STILL uses slave labour in Cambodia! When 'representative' MP George Galloway [who has told us secretly that he actually believes that direct democracy is the best way to go] expressed that; "You can't vote for a company." on an edition of Question Time in 2013 while misleading the audience about how corrupt corporates can't be held to account, he wasn't just deceitful about how your money is your vote but, he was also deceiving the audience by reinforcing the notion that they have no power [which is the duty of all so-called 'representative' politicians]. You vote with your ballot and with your money and while you can choose how you vote, you have power and so will always be getting only what you want. In the words of financial wizard and broadcaster Max Keiser; "If you want to de-capitalise, you have to decapitate - there is no middle ground." The answers to most, if not all questions about anything can be found in studying nature. Nature never maximises but instead always optimises. For example; plants never consume more energy or space than they need yet they survive, grow and [hopefully] live to fulfil their purpose. Nature makes the smartest use of what is already available to it, not the biggest use. We believe that the UK economy will be best served if we base our economy upon our natural environment and copy the behavioural elements within it by translating them into business models and, by adapting the current capitalist model so that it is based upon optimising - not maximising. At the same time, our environment will automatically become prioritised along with our economy and both will thrive. If farming practices now mean that cultivating organic food naturally is more expensive than ruining food with additives and preservatives etc, then it is obvious that we're not working with nature and are actually now working against it. It is our strong opinion that the idea of restricting/capping the personal income of anyone is oriented purely in the politics of personal jealousy. The poor are not poor because of a lack of money in the system [just as how the hungry are not hungry due to a lack of food] and so restricting the wealth of high earners will not spread wealth. It is obvious that the ambitious would leave the UK [at a faster rate than they do now] and as such, we believe that such a policy would destine any economy to a quick death. Capping personal income will not by default, address wealth distribution and poverty and if money is to be cyphoned-off and given to the poor, there would be less motivation for the poor to even attempt to generate their own wealth and this in-turn would lead to overall stagnation. In a world where other countries are already leaving the UK far behind [through the implementation of progressive policies such as hemp cultivation], stagnation amounts to going backwards and this is exactly why we say that so-called 'representative' democracy is retarded. We believe that encouraging people to be ambitious and to benefit from this while taxing high earners appropriately would be far more beneficial and, we believe that higher tax receipts combined with wealth redistribution programmes would benefit the poor and the UK economy far more than implementing restrictive policies.